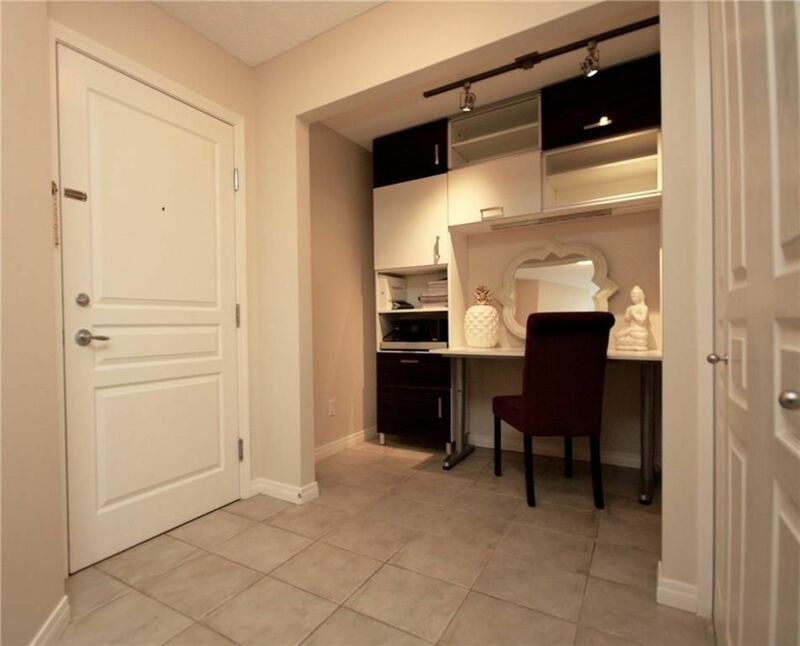 You will be impressed instantly by the spacious floor plan this 2 bedroom 2 bath condo has to offer. Large entryway and a spacious den with custom built in shelving & desk makes for a perfect study area and/or office. Kitchen comes complete with stainless steel appliances & loads of cabinet space. Dining room and living room co-exist without compromise in the open concept layout with a bright window and gas fireplace. Master bedroom can easily accommodate a large bedroom set & has its own 4pc en suite. Second bedroom is located on the opposite side of the unit for ultimate privacy and has ample closet space. 3pc bathroom & laundry complete the interior. The unusually oversized covered patio offers an abundance of space complete with a gas line for heater or bbq, & a raised flowerbed/herb garden. Sunny southwest facing unit with titled underground parking, separate storage unit, exercise room, social area, close to universities, downtown, & many amenities just steps away.